Surgeonfish (Tangs) are among the most popular saltwater aquarium fish due to their beauty, generally non-offensive behavior, and forgiving requirements. Here are profiles of some of the most popular Tangs and Surgeonfish, including scientific name, common names, distribution, maximum size, characteristics, compatibility, diet and feeding, minimum tank size, and reef tank suitability. One of the more demanding surgeonfish of the Acanthuridae Family, the Achilles Tang (Acanthurus Achilles) requires much attention. It is highly susceptible to contracting Ich and can have problems with HLLE. It can be aggressive towards other surgeonfishes, especially those of its kind. The rare Black Longnose Tang (Zebrasoma rostratum) is quite distinctive with its solid black body, black eyes, long snout, broad sail-like fins, and white razor-like spines located on both sides of the caudal peduncle. The juvenile stage of the Chevron Tang (Ctenochaetus hawaiiensis) is very colorful. However, once in the adult stage, the red and purple colors fade, and it becomes dark brown, almost black, with the sides of the body and head marked by many fine, horizontal, yellowish-gray lines. 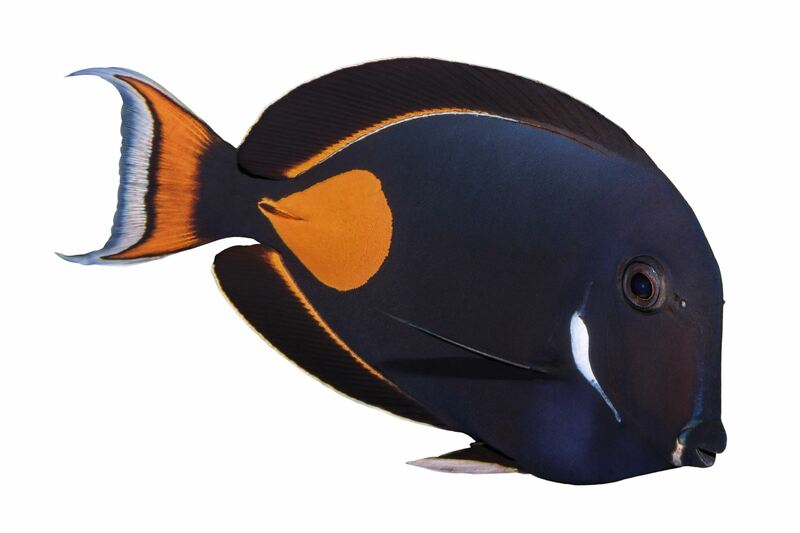 Because the adult stage of the Chevron Tang is similar in appearance to that of a Kole (Yellow-Eye Surgeonfish) Tang, it is referred to as the Hawaiian Black Kole. The Clown Surgeonfish (Acanthurus lineatus) prefers to inhabit the oxygen and marine algae enriched shallower waters of the reef. Being in the Surgeonfish Family it has all the typical traits, such as the characteristic sharp razor-like spur or spine on the caudal peduncle, it does not get along well with other same or similar species, it needs plenty of open room to move around, but also requires ample cover for hiding. Convict Tangs (a.k.a. Hawaiian Manini) are schooling fish and are found in the shallower oxygen enriched waters of the reef, where fine filamentous algae are abundant. This is in areas where there is little coral but has lots of rocks or stones that allow the algae to grow well with good sunlight exposure. The Goldrim Tang (Acanthurus nigricans) is a very shy fish, but once acclimated to its surroundings it becomes very active. It is best kept singly. If you insist on having more than one of these fish they should only be kept in a very large tank with ample cover, and not be kept with other more aggressive Acanthurus species. Restricted to Hawaiian waters, this very rare quirk of nature where an Achilles Tang (Acanthurus achilles) and a Goldrim Tang (Acanthurus nigricans) have merged together during conception. It is one of the few reef fishes in Hawaiian waters known to hybridize. The Goldrim Tang is not common in Hawaiian waters, and the Achilles is endemic to them. The Kole Tang (Ctenochaetus strigosus) is a fantastic algae consumer. It also makes a good choice when it comes to compatibility with other more docile, non-related species. The Naso Tang (Naso lituratus) is a herbivore, with a diet preference for brown macroalgae. Some specimens may be reluctant to eat anything else, but for the most part, this species will usually accept the basic tank fed diet for Tangs & Surgeonfishes. On rare occasions, an individual may pick at-large-polyped corals. Because of its size and constant roaming nature, the minimum aquarium size suggested for the Orange Shoulder Tang (Acanthurus olivaceus) is 135 gallons. As long as the aquarium is large enough, a juvenile and an adult may be kept together. It is generally compatible with other non-aggressive tank mates, but if plans are to keep this species with other Surgeonfishes, it is recommended to add this fish first, or if of the same species, place them in the aquarium at the same time. Most often recognized as "Dory" from the movie "Finding Nemo," the Pacific Blue Tang (Paracanthurus hepatus) is a popular choice for aquariums around the world. Unlike most tangs or surgeonfishes that require a steady diet of algae, the Pacific Blue Tang should also be fed meaty fares to satisfy its zooplankton dietary needs. The Powder Blue Tang (Acanthurus leucosternon) is a very popular fish with aquarists, but one that is not easy to care for as the Powder Blue Tang requires much attention. It is highly susceptible to contracting ich and can have problems with HLLE. It can be aggressive towards other surgeonfishes, particularly those of the same shapes and color. The Powder Brown Tang (Acanthurus japonicus) is primarily a herbivore that will graze on filamentous micro and some types of smaller fleshy macroalgae. Should be fed a diet of frozen and dried fares suitable for herbivores that contain marine algae and Spirulina (blue-green algae). Zucchini, broccoli, leaf lettuce, and nori (dried seaweed) can be offered to supplement its diet. Should be fed at least 3 times a day. A profile of the Sailfin Tang​ (Zebrasoma veliferum), including photos, scientific name, common names, distribution, maximum size, characteristics, compatibility, diet and feeding, minimum tank size, and reef tank suitability. The Sailfin Tang (Zebrasoma veliferum) adjusts well to aquarium life, adapting easily to basic tank fed foods like flake food, shrimp, Nori (sheets of dried kelp), just to name a few. We find they will eat just about anything, but being more of a herbivore, they prefer greens. The distribution of the Unicorn Tang's (Naso unicornis) extends from Hawaii southward to central Polynesia, westward through Micronesia and Melanesia, through the East Indies, and across the Indian Ocean to the coast of Africa and the Red Sea. The popular Yellow Tang (Zebrasoma flavescens) is a herbivore, grazing on alga and other plant life. It is best kept in an aquarium that has good algae growth, where in turn they earn their keep by helping to keep the algae growth cropped. It will feed on Nori (dried or roasted seaweed), other green vegetable matter and vitamin enriched flakes, but may nibble at dried shrimp and other meaty fares as well.